Los Angeles-Based Palms Elementary, to Receive $20,000 School Garden Makeover! 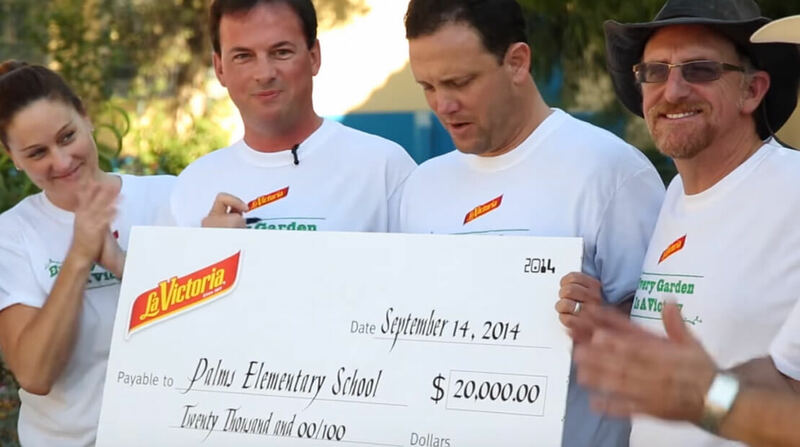 The makers of the LA VICTORIA® Brand are proud to announce Palms Elementary School as the winner of the 2014 LA VICTORIA® Brand School Garden Makeover. As part of the reward, the California-based Mexican salsa and sauces brand will provide a grant that includes gardening tools & supplies, expert guidance, learning materials and more. Palms Elementary School is determined to incorporate the value of gardening into its curriculum. Although an existing garden is in place, the school faces numerous obstacles in developing their ultimate vision. Minimal shade, basic tools and little-to-no funding are just a few hurdles. Additionally, limited shade over the garden has made learning in the garden difficult as children are subject to the hot California sun during its peak time of day. Currently, the garden is maintained by a beautification committee, made up of teachers, administrators, parents and the community. However, with La VICTORIA® Brand’s grant support behind Palms Elementary, students will have the opportunity to learn about fresh vegetables in a safe and healthy environment. A group of community volunteers and LA VICTORIA® brand employees broke ground last month to clear space for the new garden. The garden makeover will be executed with the help of the Motor Avenue Improvement Association (MAIA), a non-profit organization that works to improve the Motor Community in the Palms area, one of the densest areas in Los Angeles. Palms Elementary School is home to one of the seven interconnected urban gardens, four of which are community gardens and three are school gardens in the Palms Neighborhood. The Palms garden makeover project will include new raised garden beds, a drip irrigation system, a shade sail system to protect children from the sun, a compost system and outdoor shed to keep new tools safe. To facilitate garden lessons outside, bench seating and an outdoor table will be provided. The makeover will also include a donation of a variety of plants and trees. Easier access to the garden will teach students about healthy living, academic achievement, community and social development and environmental stewardship. School gardening programs are increasingly in demand, intended to offer life-rewarding experiences and knowledge to students and the surrounding communities. In addition to renovating the garden and implementing it into the curriculum, Palms Elementary intends to work towards creating a farmers market to offer fresh produce to its community and continue funding the garden by reinvesting from produce sold. The makers of the LA VICTORIA® brand products embrace the value and benefits of growing fresh vegetables at home and in the community. It has made a commitment to using quality ingredients, like the tomatoes in their salsas, which are harvested and bottled all within 24 hours. By offering support to Palms Elementary School, the makers of the LA VICTORIA® Brand can hope to help instill a desire in children to learn about the importance of eating fresh fruits and vegetables. Established in Southern California in 1917, the makers of the LA VICTORIA® brand were the first to make jarred salsa and other Mexican sauces more than 90 years ago. LA VICTORIA® products include salsa, taco sauce, enchilada sauce, chiles, tortillas and tortilla chips. The brand is known for its fresh flavor and quality ingredients. LA VICTORIA® products are distributed by MegaMex Foods LLC, a maker of a comprehensive portfolio of products that resonate with Mexican-American and mainstream consumers of Mexican foods. Visit www.lavictoria.com to learn more. MAIA is a cooperative organization of businesses, property owners, and residents primarily located on Motor Avenue between National Blvd and Washington Blvd. The Motor Avenue Improvement Association seeks to improve the quality of life for its members and the Motor community by assertively promoting the community’s interests and facilitating community services and programs. Palms Elementary is home to the most considerate children in the city. Their students play, eat and learn with individuals from over 20 different nationalities. Further, with premiere Deaf or Hard of Hearing and Kindergarten Collaborative Class programs the students are welcomed individuals of all abilities. Finally, every major religion is represented at Palms. These students don’t see color, ability or religion, they see people.